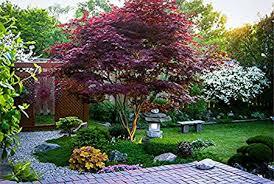 Emperor Japanese Maple Tree, 2-3' size, Acer palmatum 'Emperor'.Hardy zones 5-8, 12-15' tall and wide at maturity. Considered one of the most vivid, strong trees with good vigor and hardiness. Beautiful red leaf holds it's color well. Full sun to part shade in average fertile soils with good moisture and drainage. Will be shipped semi bare root. Not able to ship to AZ, CA, WA, OR, ID, NV, HI, or AK.